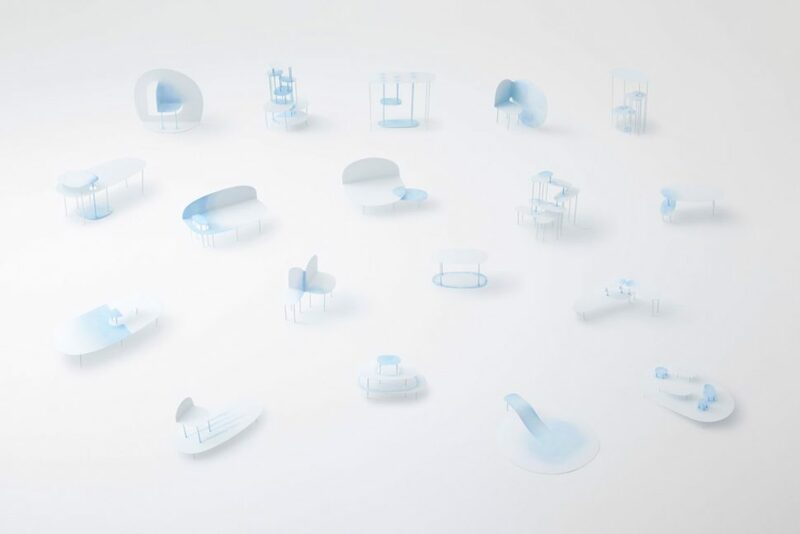 Nendo, a Japanese design studio, has announced that they will be releasing a new collection of steel furniture. The sturdy 18-piece set has unique designs scattered across each item. The design has been inspired by the haze-like affect water colors have on paper. All of the pieces are solid white with a gradient blue “watercolor” design, unique to each piece. The furniture collection itself consists of end tables, chairs, benches, and even combinations never before seen. “This combination of function and a seemingly handcrafted technique has brought about eighteen new shapes that also offer new ways of use,” said Oki Sato, founder of Nendo. “A single object has a single function, but by combining the furniture in different variations, we can create new relationships and interesting stories,” he added. The shapes of the furniture are rounded and smooth, which gives a very modern tone to the otherwise industrial looking steel. Before painting, the steel went through multiple stages of hand sanding to get that seamless finish. This also allows them to pull of the hand-made steel furniture look. 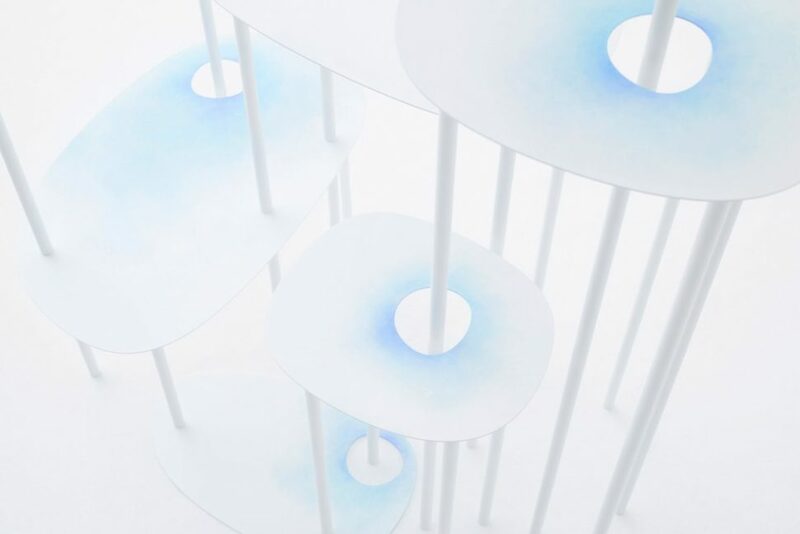 “This production process allowed us the opportunity to play with animated colour effects: colour blends where there are meeting points, and stains and colour run down in a waterfall effect on overlapping parts of multi-layered objects,” Nendo explains. The detail doesn’t stop there. 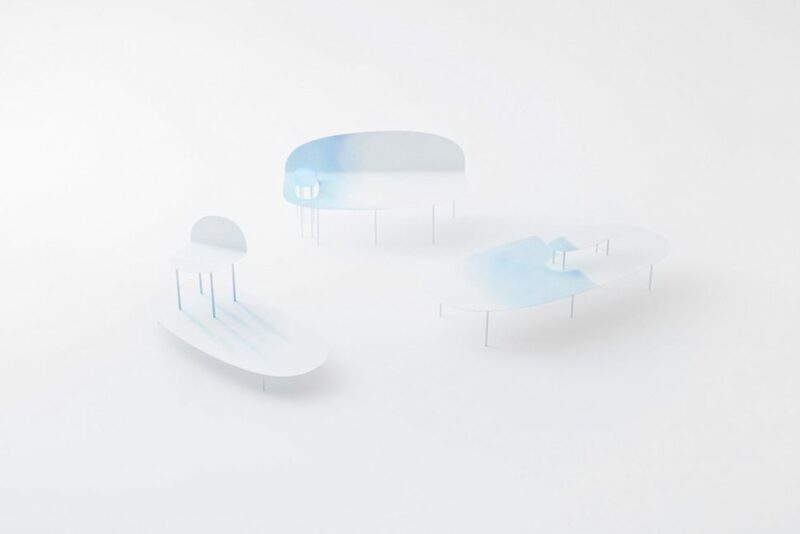 Nendo wanted to mimic the effect watercolors have on paper, hince the white base layer. The white isn’t a normal gloss white. Instead, Nendo went with a matte finish in order to portray the paper properly. Some of the designs are simple enough, but you can really see Nendo’s creativity blossom with many of their unique pieces. For some of the more simple steel furniture designs, they merely folded a sheet of steel over to create a sitting surface. Then, on the opposite end of the spectrum, you have tables like the one pictured above. Each surface is connected by the legs of another table. You can also see holes in various places to allow the legs to pass through. 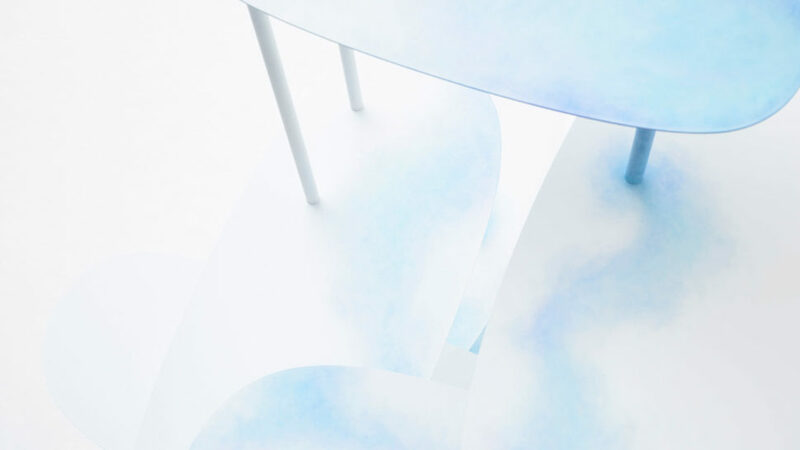 All this, described by Nendo, as an “intersection of ellipses.” Each surface is only about two millimeters thick, and each support rod an astonishing 20, creating an “airy” appearance and “ethereal and transcendent” affect. This new collection will be presented by Friedman Benda at Miami Design/Basel in Switzerland from June 11-17 this year. What do you think? Could you see any of these pieces being a success? Furthermore, can you see yourself using any of them? We hope big things will come out of this simplistic yet eye-catching collection.